As the temperature starts to creep up in Singapore it can sometimes feel somewhat challenging to entertain little people without stepping inside another soft play. And it gets really expensive really quickly! If you haven't already discovered The Artground at Goodman Arts Centre then now is a great time! Firstly it's FREE and air conditioned. If those aren't two very convincing reasons to head east, then maybe the newly designed play space, Rolling @ TAG will tick your boxes. Or there's the upcoming 100 and 100 More festival coming at the end of May. Oh and, in case you STILL need talking into this, there's a very nice cafe just a stones throw away (Cafe Melba). 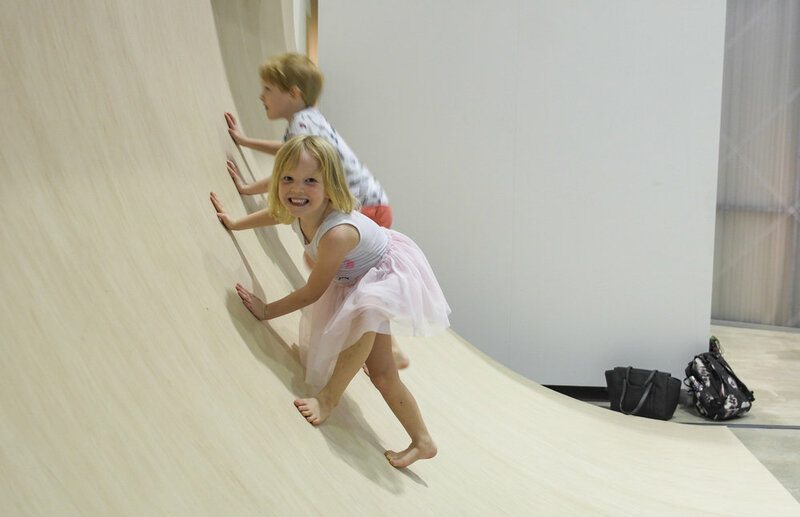 Within the main building of The Artground, Rolling @ TAG is basically an indoor play ground for little and big kids (although it's aimed at ages 0-12 years, but whatever). But when I say playground, I don't mean in the traditional sense. It's been designed by Japanese artist Daiya Aida and provides prompts for play, but doesn't lead the play. There is a cosy nook for sitting, lying and chilling out that is protected within a structure that clearly resembles a climbing frame. So kids can sit back and watch whilst still being right in the thick of the action. Or, you know, the adult(s) can sit back and relax whilst kids clamber around them. In that sense it's really nicely thought out, and even though an age range of 0-12 years seems quite vast, I can see how the space is appropriate for a crawler or a pre-teen with a tonne of energy to burn. The space itself is incredibly simple with a focus on curves and, surprisingly enough from the name, the motion of rolling. It's fun, I won't lie. And I don't know who was having a better time running up the curved wall and sliding back down, there were definitely some grown up's channeling their inner kid when we were there this morning. Yes, I saw you, you Ninja Warrior wannabe's. It's quite a cool concept actually, to have a space for child's play, literally, but where there are no hard and fast rules about how the space should be used or interpreted. And I think that might have something to do with the fact that there were quite a lot of kids causing mayhem this morning, and yet there were no accidents, no tears and the only tantrums were to do with having to leave at lunchtime (Clara....). The kids, left to their own devices, figured it all out for themselves. Which is the beauty of childhood and play time isn't it?